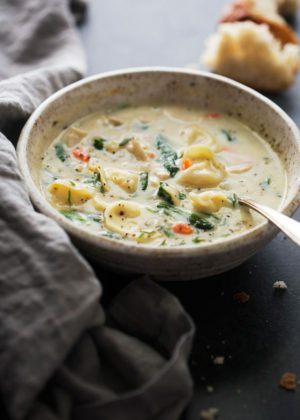 This creamy chicken tortellini soup is the epitome of comfort food! It’s a luxurious combination of cooked chicken, carrots, baby spinach, and a hint of nutmeg to warm everything up. It’s sure to be a hit with everyone! Fall. And when I say ‘fall’ for those of you that don’t live in the south, lemme tell you all about it. Fall is the season southerners eat soup, wear blankets, turn the air conditioner up and pretend it’s chilly outside. True story. ? So allow me to pretend it’s chilly out and the leaves are turning. 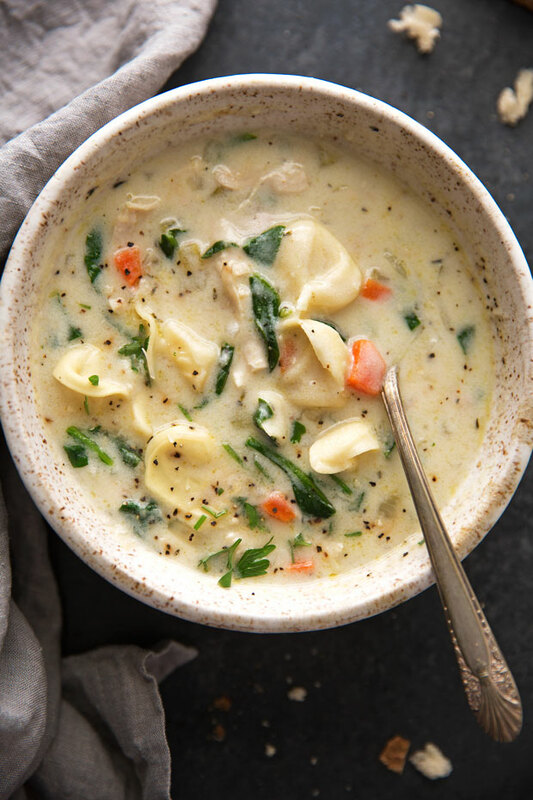 Let’s eat chicken tortellini soup like we NEED it. 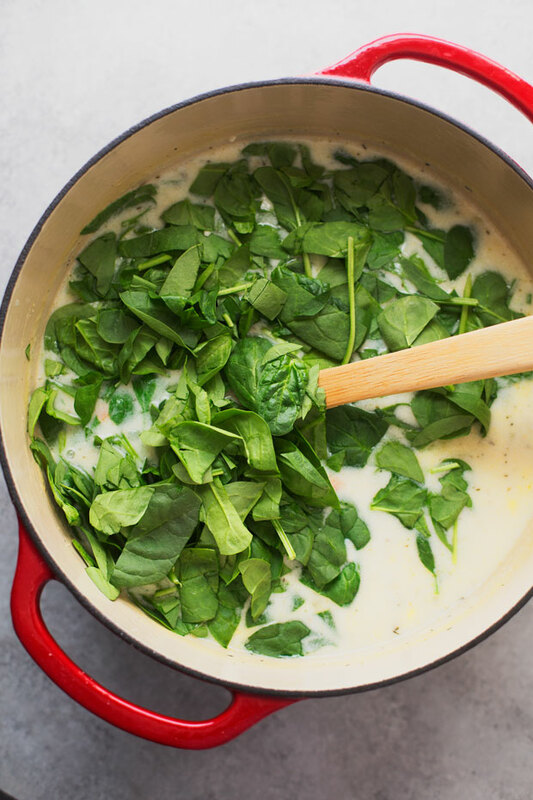 From the velvety smooth, milky base all the way to the cheesy tortellini and the tender chicken to the vibrant baby spinach. This tortellini soup totally speaks my language. So i’m doing a little reWind Wednesday. Is that a thing? NO. Are we gonna try to make it one? yessir. What that basically means is that, this is a recipe that i’ve made previously on the blog. 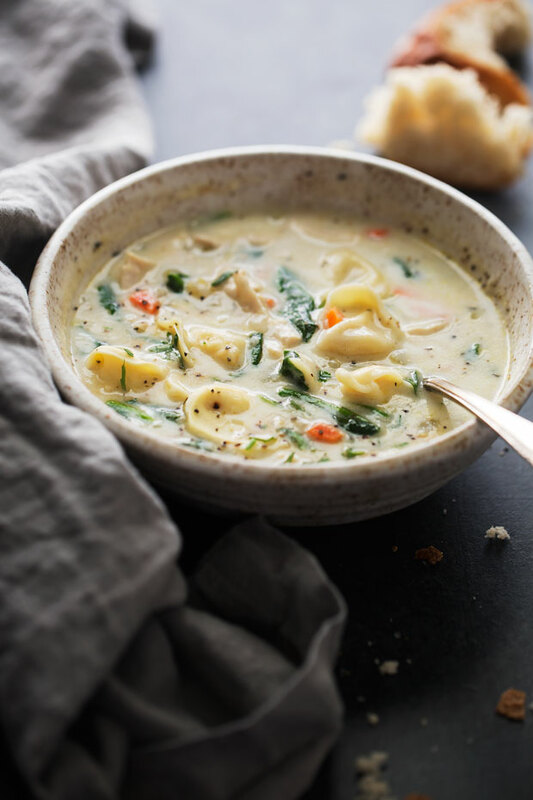 We’re just hitting the refresh button a bit with new pictures, an easier to follow recipe, and a few tweaks to make this the best chicken tortellini soup you’ve ever freakin had. I have been making this soup for years. It’s actually a pretty funny story on how it came about. ← Um… What? No, it’s really not. It happened to be the contents of my refrigerator + pantry that became a [super successful] dinner one evening. And then again the following week. And ever since then, this soup has become a staple on our dinner menu. But sometimes, you start tasting your own recipes and making them a little differently without knowing and then come to realize that you somehow you managed to make the best chicken tortellini soup just a tad bit better. I’ve served it to guests and family and every. single. time. this chicken tortellini soup gets nothing short of applause followed by requests for the recipe. If I had to describe this soup in one way for you, I would say it’s like a creamy chicken noodle soup with cheesy tortellini instead of the egg noodles that traditional chicken noodle soup calls for. It also kinda sorta reminds me of the chicken gnocchi soup from Olive Garden. I’ve never had it before, but I know friends who would give away their first born for it. I’m not a huge fan of the Olive Garden — i’m the only one out there, aren’t I? I just prefer the love and care that goes into homemade soups — an ingredient the Olive Garden really can’t add. Also, gnocchi isn’t my thing. No shocker there right? I’m a texture girl, and gnocchi kind just resembles mush. This chicken tortellini soup recipe is simple. It all starts by sautéing the aromatics. A little bit of butter, some celery, chopped onions, and lots of garlic. Get that going in a pan. Then comes the flour and milk and chicken broth. We’re using cooked shredded chicken for the soup so if you want this for dinner TONIGHT grab a rotisserie chicken on the way home, it’ll save you a bunch of time. We load it up with some freshly chopped baby spinach and – wait for it – the cheesy tortellini. 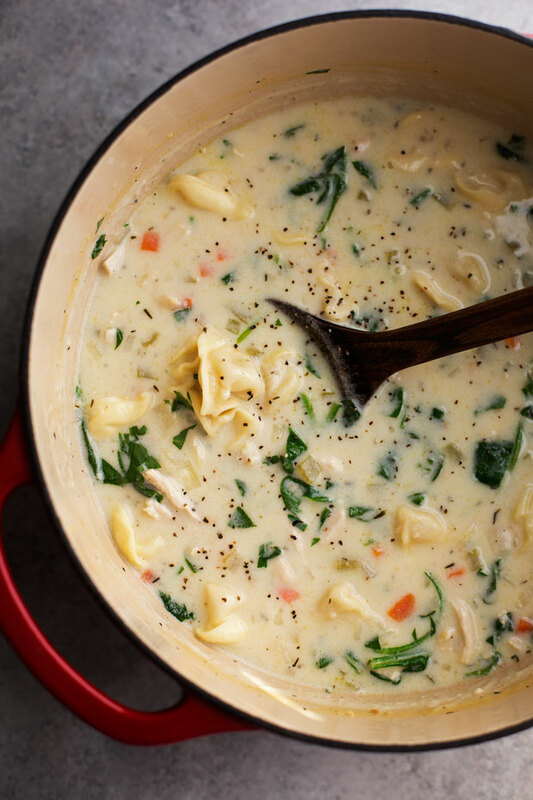 The tortellini is what makes this chicken tortellini soup (hello — kind of a given right?) – that pasta wrapped around cheese into these use little buttons. ♥ Not only are they totally adorbs but they’re also loaded with so much texture and flavor. I call them them the ‘cheese bombs’. The tortellini gets tossed in at the end along with that fresh chopped baby spinach so that it doesn’t soak up all that soup. Something to note, if you’re anticipating leftovers, you can just add the cooked tortellini into your soup bowl rather than the pot. I keep leftover tortellini separate from the soup. Trust me, it’s a lot easier (read: tastier) that way! And just so you’re aware of how this soup business is going to go down, you need to slurp and chew big bites of this chicken tortellini soup from large bowls with crusty bread all dipped in it like it’s nobodies business. I’ll also point out that chicken is optional for this soup. Yes, it’s in the title of this recipe, i’m aware. But with all the carrots and spinach and tortellini, the chicken is something that can be skipped to make this vegetarian friendly (swap the chicken broth for veggie too please!). You can also go the other way and skip out on the tortellini (but please, please don’t) it’s what makes this soup so balanced with that chicken and veggies. I’ve used egg noodles in a bind (and when i’m watching’ them pesky cals) and it works beautifully. 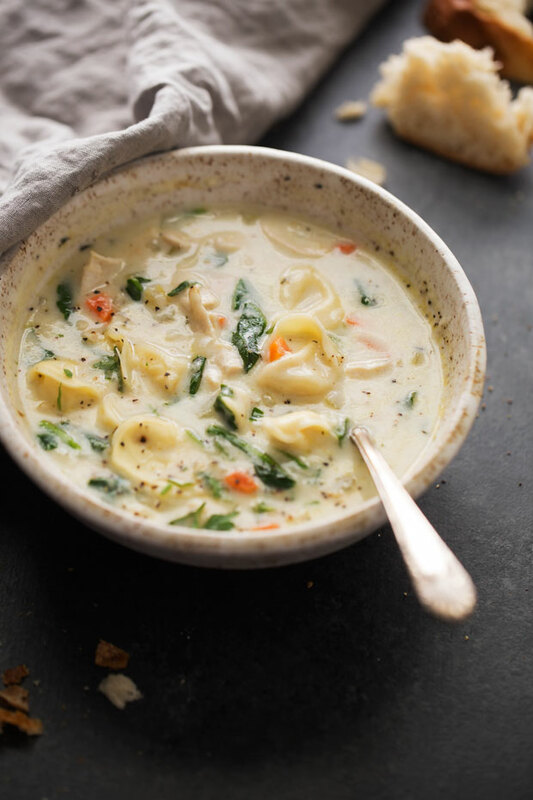 My creamy chicken tortellini soup is totally calling your name. This is how we soup. Prepare the tortellini according to directions listed on the package. (Note: you want the tortellini to finish cooking about the same time that the soup is finished cooking). In a large pot over medium high heat melt the butter and sauté the mirepoix mix for 6-8 minutes or until the onions start to turn translucent. Add the garlic and cook for 30 seconds or until it’s fragrant. Add the flour and continue to cook for another 1-2 minutes or until the flour is completely mixed in and starts to just barely become a light golden color. Add the milk in a steady stream while you stir. This is helps loosen up the flour mixture. Add the chicken broth. Allow soup to come to a boil, keep stirring as necessary so that nothing sticks to the bottom of the pot. Add the chicken, carrots, tortellini, baby spinach, along with the thyme and nutmeg and stir. Let everything come back to a simmer before turning the stove off. You want to serve this immediately so that the tortellini doesn’t soak up all the liquid. Top with parsley and serve with crusty bread if desired. You can replace ¼ – 1 cup of the milk with half and half or heavy cream to make this a more decadent soup. The original recipe (posted Oct 3, 2014) called for ½ cup of half and half. To make this soup with the original recipe use: 3 cups milk + ½ cup half and half + ½ teaspoon nutmeg. Everything else remains the same. 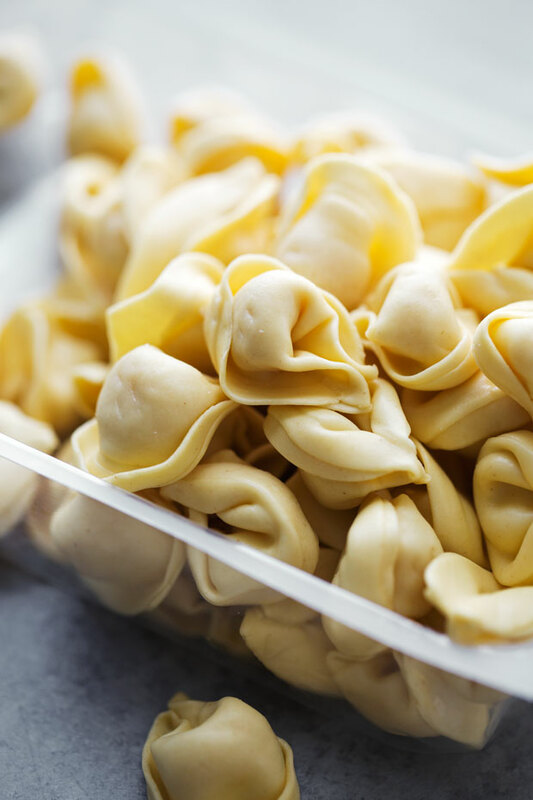 If you’re anticipating leftovers, you may want to keep the tortellini separate and just add it into your soup bowl. This will keep it from soaking up all the soup when refrigerated. Also, you may need additional milk/broth when reheating. ORIGINAL RECIPE POSTED OCT. 3, 2014. UPDATED SEPT. 28, 2016 WITH NEW PICTURES, MINOR RECIPE ADJUSTMENTS, AND EASY TO FOLLOW INSTRUCTIONS.